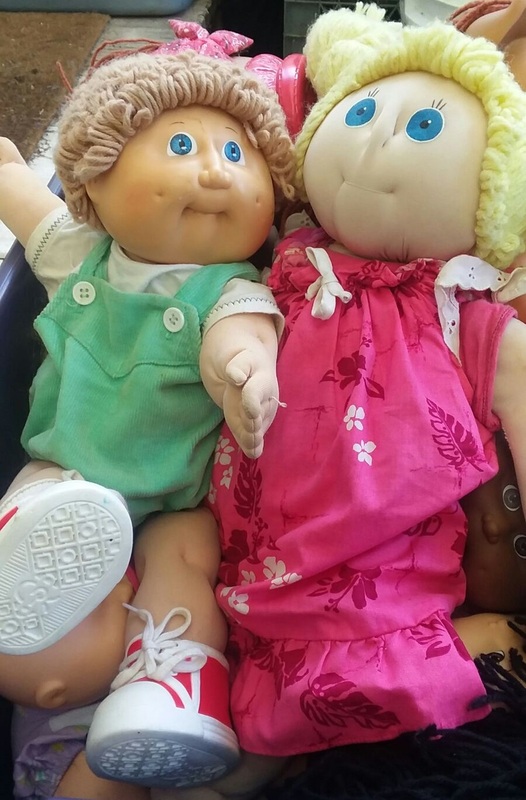 These are my Cabbage Patch kids! There are many emotions tied to them. My dad climbed into the attic and dug them out for me. I’m so excited to see them and know that they are in great condition. I always knew they were there, but I never really had any need of them until my Tadbit came along and loves dollies (and Lightning McQueen, Olfa, Anna, Elsa, cats, cows, etc). I can’t wait until we go to the US next year. Charlie Caleb is on the left. His name was Charlie Randy, but I didn’t like how it sounded with my last name, so I sent in his birth certificate to get it officially changed. Charlie is fe-male. It depended on my mood and what I dressed them/it up in. Those are it’s original clothes (and shoes I think). Heidi was made by my mom. I didn’t appreciate her (the doll and my mom) enough when I was younger, but my heart aches with love now at how much my mom loved me. …is when I last saw my mom. And so much has changed since then. The kids and I survived our 8 weeks of summer holiday. We even thrived during some of that time. But it sure was challenging some days. I then had one more week all to myself, with the kids back at daycare and Mr Siili at work. It was bliss. I was lazy, cleaned a tiny bit, got my hair done, ate lunch downtown, slowly. I do wish some of the days had a been a bit easier during the summer. Paxlet will soon be 5 years old. He is in a phase of not listening to us. We say something nicely/calmly several times and he doesn’t acknowledge us in any way. When we raise our voice or yell, he say “yeah yeah” or starts crying. I know he’s a little boy with big emotions, but this is draining! And little Miss Tadbit (2yr 4 mo), she copies EVERYTHING her big brother does. ‘Peat and Repeat’ comes to mind. A a much better description of them than ‘monkey see, monkey do’, although that is valid too. She’s full of personality. And even the annoying things she does at times are still pretty cute, just because she is still young. I love my kids an insane amount, but they are challenging for me at times. On my first day back at work, I barely manage to remember my computer password. Then I was still deactivated in the system, which thankfully only took a few minutes to solve. I had over 300 emails to go through. And basically just took my time getting back into the swing of things. After work, as I was on the bus home, when I saw my bus in the lane next to us! I had hopped on the wrong bus! Thankfully it was easy enough to hop off at the next stop, take a 2nd bus, which brought me back around to my intended bus line home. Then, at the library, a man working there did a double take at me and wondered/asked if I was the same woman who was with her 2 kids during the summer who spoke to said kids in English. (My hair color had changed since I was last there and I wasn’t with kids at this moment.) When I said it was me, he asked why I was speaking to them in English. When I replied that I am American, a little light bulb went off in his eyes. I’ve been asked this question before and I find it interesting. Either I look very Finnish (which I’ve been told I don’t do a bad job of it) and/or my Finnish language skills are so good that they think I’m a Finn (maybe, possibly, depending on what I’m talking about). However, I don’t think this specific guy heard me speak Finnish. I’m not sure what to think about this. Mostly I’m just amused. So, the kids are back in daycare. I’m back at work. And life is back to normal again. My first ever CD was Jewel’s Pieces of You that I won off a radio contest. I immediately went out and bought a portable CD so I could listen to it in my car (which had a cassette player in it). I loved the CD. It wasn’t quite my regular style of music I listened to, but the words and tunes were simple, catchy and heartfelt. They were relatable. When I saw that she had a book out, I was instantly intrigued. And I wasn’t disappointed. I learned so much about Jewel and what has made her who she is today. Her life has been far from idyllic, but she persevered and has overcome so much. When many would have given up and let life destroy them, she looked within herself, carried on and achieved what she has today. It is wonderful to read that she has made peace with her past and found what makes her happy and works for her in life. I know I enjoyed this book when it took me less than two weeks to read (that’s quick with 2 littles in the house). *I received an advance copy from the publisher via NetGalley in exchange for an honest review.